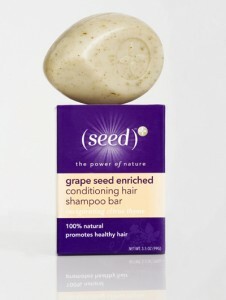 Seed’s Shampoo Bar : Is It Good? I hate sodium lauryl/laureth sulfate in my shampoo. SLS is a surfactant and foaming agent that’s in nearly 90% of all shampoos (and a lot of other things that make foam, like toothpaste and bubble bath). I don’t think it will give you cancer or anything but man, it leaves my skin so dry and itchy, especially in the winter. I will readily admit, I am not a daily shampooer. Even with my really short hair, my hair just doesn’t need daily washing and I imagine it would dry out exponentially if I were to do so. I usually get by with shampooing with liquid castile soap or using a conditioner to “wash” my hair, both of which are somewhat less than ideal. The castile soap isn’t moisturizing enough on its own in the winter and I’m still hunting around for a conditioner I like. So, after shopping around for a while for an SLS-free shampoo, I finally did what I usually do in this sort of situation: I went with the cheapest option I could find. Fortunately for me, this turned out to be Seed’s Lathering Shampoo Bar (in Simply Unscented). First of all, it lathers like a dream. I had my doubts about that, but the contours of the bar are ideal for rubbing against your scalp to get a lather going. It doesn’t really smell like anything (which is exactly what I wanted), and it leaves my hair and scalp clean, but not tight, dry, or itchy. If/when I return to coloring my hair, I would probably follow it up with a conditioner, but right now, I’m able to skip it and my hair feels great. It also works well on my daughter’s chin-length hair, but her hair is a frigging dream and I think I could wash it with dish soap and it would still look good. So… is it good? A great shampoo, with no SLS and no plastic bottle to recycle — for under five bucks — definitely good. Thanks for mentioning this. I think I’m going to try it – my scalp gets wicked itchy in the winter too and I wouldn’t be surprised if it was the sodium lauryl sulfate. Did the packaging indicate how long or for how many shampoos the bars usually last? You know what I noticed? It’s an SLS that was the initial issue – and an SLS (bar) that provided the solution. weird. I don’t think it does say how long it should last. It’s a pretty solid bar, though. I think if it was kept dry(ish), it should last a while.